In the morning. 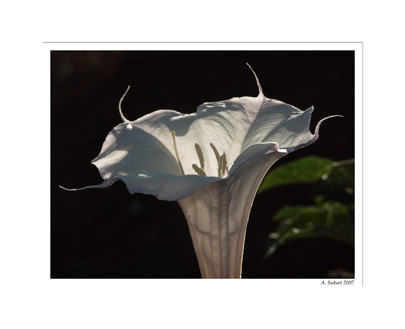 Datura. Before the sun, which causes it to fold up and retreat into it’s own inner thoughts and processes. This weed grows in the most unattractive of locations and rewards those who visit there with such beauty it is hard to reconcile. This one was in a trash heap of road construction rubble south of the town of Winslow, Arizona, during the monsoon season of 2007. I think a rainbow ended here, as well.